You are a forest landowner. The people of North Carolina owe you a great debt of gratitude. Your forests improve our scenery and create many tourism-related jobs; your forests are home to the diverse wildlife that we all enjoy watching and some enjoy hunting; your forests are the source of high-quality drinking water; and produce products and jobs we rely on every day, from boards to boxes to paper products and more. Community vitality is intrinsically linked to the health and productivity of privately owned forests. Forest Health—Community Wealth is about your forest. This Forest*A*Syst publication is meant as a personal, confidential learning tool to help achieve your goals for forest ownership. First, answer the self-assessment questions below to determine where your interests lie, and then continue reading to learn practical ways of pursuing these interests. To gather more information, review the sources of information in the Getting Help section and tap these sources to learn even more. Also, don’t forget to follow the directions for developing a management plan tailored to your dreams for your forest. If you decide that you would like help from professionals, review the public and private sources listed below. Complete the questionnaire and, if you’d like, share it with the wildlife biologist, soils specialist, forester, or other natural resources professional(s) you choose to call. Before working with a forester, first check with the North Carolina State Board of Registration for Foresters to verify their registered forester credentials. Enjoy your forest, develop a written plan, and please accept our thanks for making North Carolina green and beautiful. On a scale of 1 to 10, rate how interested you are in each of the following possible objectives for your forest. Then total your score for each column and transfer your scores to the bottom for your evaluation. Transfer your scores from the bottom of this chart to the appropriate category below. This begins the process of ranking your objectives for your land. ** Column 4 should always total 40 because water and soil protection is essential for every landowner. Is your forest all it could be? If you have recently acquired forested acreage in western North Carolina or have never considered the potential of your forest and would like to learn more about how to enhance your property, take some time to work through this guide. It has been developed for forest landowners like you, who may want multiple benefits from their land, such as natural beauty, recreational opportunities, clean water, wildlife, and income. Even if you’ve lived here for many years, a plan for your forest is a wise investment for your future. Do You Have a Plan to Manage Your Forest? Owning forestland in western North Carolina is a wonderful privilege and opportunity. New landowners are usually eager to get to work on their property. But resist the impulse to bring in a bulldozer right away, and develop a management plan first. Think over the reasons you bought the property. and prioritze Talk with friends and family. If you bought your forestland for its wildlife values or as a getaway for recreation and family enjoyment, timber revenues may not be a high priority. However, a management plan can still enable you to attain your goals. First, make a list of the activities you plan to pursue on your forestland. These can vary widely with each landowner and will reflect your interests and lifestyle. Be sure to answer the self-assessment questions above. Once you have identified your interests, you can use them to develop short-term objectives for your property. Do you need immediate income to initiate your plans for the future, such as establishing food and cover for wildlife, clearing trails for hiking and recreation, or planting trees for the future? Then a harvest of trees may be warranted. List any constraints that may restrict how you manage your forest. You may wish to share this list with a natural resources professional who can help you develop your plan. To be an effective tool, your management plan must be practical. It should reflect your hopes and desires for your land, combined with a realistic assessment of your skills and resources. Once you have defined your goals, you can get assistance to assess your forest’s condition. It’s important to choose management strategies that will take you toward your goals. Your forest is as individual as you are, reflecting past activities as well as your care and philosophy of land ownership. Decisions made today can have far-reaching effects. Whether your forest is young, middle-aged, or mature, it will be your legacy for the future. What Kind of Forest Do You Have? Forests vary by elevation, topography, history, soil characteristics, exposure, and drainage. 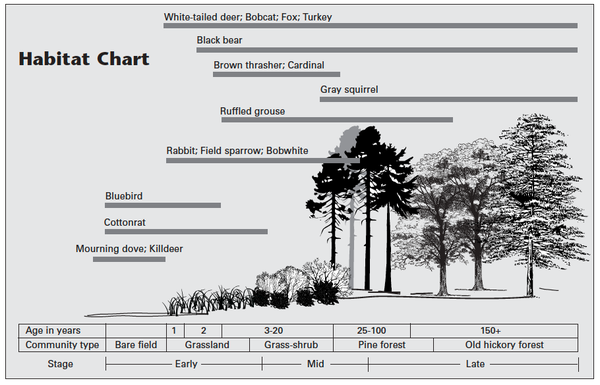 Use this section to help identify the age and condition of your forest and the associated wildlife that may be present in it. Young forests, which range in age up to 10 years, are the result of some type of disturbance or land use change. This can be the result of weather-related forces (hurricanes, tornadoes, ice storms, fire) and / or human actions such as the development of abandoned farmland or intentional seeding or sprouting after logging operations. A young forest has an abundance of young tree growth, as well as scattered shrubs, weeds, wildflowers, native grasses, and brambles. Goldenrod, asters, black-eyed Susans, broomsedge, blackberry, and pokeweed are most notable. Young forests and fields provide food and cover for quail, rabbits, bluebirds, goldfinches, indigo buntings, and song sparrows, as well as deer, bear, and turkeys. Ruffed grouse and wild turkey hens also feed their broods in young forest openings where insects are abundant. As a forest ages, the grasses, weeds, and shrubs of the early stage of forest growth are replaced by trees with relatively small diameters. Middle-aged forests begin to take on the characteristics of more open woodland. This period can range in age from 10 to 70 years. As a middle-aged forest develops, some of the understory vegetation that was so abundant in the young forest is eventually shaded out. Leaf litter begins to cover the forest floor, and brushy cover and food for small wildlife become sparse. Within the midstory tree level, there is an increase in seed and fruit (mast) production, including wild cherry, flowering dogwood, serviceberry, wild grape, and greenbrier vines. Mature forests are usually made up of large-diameter trees and a diverse understory. The understory development is the result of timber harvesting or a natural thinning process that removes suppressed and diseased trees from the canopy. As larger trees die and fall or are removed, their demise allows more sunlight to reach the understory. Sunlight stimulates the growth of woodland wildflowers, ferns, and low-growing shrubs such as blueberry and huckleberry, adding to the beauty and wildlife benefits of these forests. A mature forest may remain standing for another century until age, disease, insects, pollution, and other factors work to begin the cycle anew. Straight, healthy, mature trees can produce good sawtimber for furniture and homebuilding. Mature forests also provide a wide variety of recreational opportunities, such as wildlife observation, big game hunting, birding, and wildflower enjoyment. Important components of a mature natural forest are snags, which are standing dead or partially dead trees. Standing dead trees are important feeding and nesting sites for insect-eating birds, many of which feed on forest insect pests. Hard snags are recently deceased trees that usually have some limbs remaining, a mostly sound interior, and fairly intact outer bark. Soft snags usually have no limbs and are in advanced stages of decay, with little bark remaining. There are also cavity trees, or den trees, which are live trees containing at least one suitable nesting site. Den trees provide permanent shelter for squirrels, raccoons, possums, and owls. Large, mature trees with broken-off tops and large broken-off branches, old wounds or scars, or holes make perfect cavity nest trees. Each stage of forest development provides a vital link in the ecology of the southern Appalachian forest. Certain wildlife species that are closely tied to a particular stage of forest growth may not be present in your forest unless that stage is provided. Developing a forest management plan allows you to emphasize wildlife species you are particularly interested in, increasing diversity, beauty, and personal enjoyment while improving forest productivity. Do You Wish Your Forest Could Do More? Once you have identified the stages of forest development in your forest, you can explore your management options. Forest management practices fall into three categories, depending on the age and condition of the forest: 1) forest establishment or regeneration (young); 2) intermediate stand management (middle age); and 3) regeneration harvest (mature). To accomplish your wildlife, aesthetic, or timber goal, you may need to start over, tend your trees, or harvest. In forest management, a stand is a group of trees sufficiently uniform in species composition, age, history, and site conditions to be recognized and treated as a separate management unit. A forest property may contain one or many stands. The range of practices used over the life of a stand is called silviculture. It links timber management or treatments in a logical sequence to meet goals and objectives. Well-planned harvests can create a patchwork of forest age classes and tree species over time that can provide for a variety of wildlife. Establishing or regenerating a forest can be achieved artificially (primarily by planting trees) or naturally by relying on seed, sprouts, and / or naturally occurring seedlings. These practices are used to restock the forest with desirable trees. Reforestation sets the direction, shape, and appearance of the ensuing stand; establishes attractive, diverse forest edges; controls competition from other plant species; and creates a different look and habitat. Before planting trees, you often must prepare the site. Depending on conditions, different methods can be used to clear the site, such as fire, herbicides, manual labor, or heavy mechanical equipment. Fire is inexpensive and promotes beneficial food and cover plants for wildlife. But before you conduct a burn, always ask a forester to help you develop a burning plan because of the risks involved. Tree planting allows you to select and space tree species. Wide spacing encourages more wildlife diversity, while close spacing is used for timber production. Tree planting may be done by hand or machine. But to succeed, you must select species adapted to the site and carefully plant high quality, healthy, fresh seedlings. You can establish a diverse forest by varying planting density and leaving openings; by planting along the natural contour of the land; by mixing the species; and by protecting areas along streams to enhance water quality, wildlife habitat, and scenic diversity. Natural regeneration is the cheapest way to reproduce a stand. It relies on available seed, stump sprouts, and existing seedlings to produce the new stand. Careful planning and timing are required for natural regeneration to succeed. Success depends on whether there are enough seeds and moisture, whether the seedbed is well-prepared, and whether competing vegetation is controlled. Your forest will be healthier and more productive if it is tended. The purpose of tending is not to create new forests. Tending practices such as thinning, improvement cutting, weeding, or timber stand improvement are meant to improve the growth rate, stem quality, or species mix of middle-aged stands. Managing intermediate-aged stands includes removing trees and vines to reduce competition and removing undesirable species. Generally speaking, trees or herbaceous plants that do not contribute to your objectives for timber production or to your wildlife, aesthetic, or recreational goals can be eliminated in favor of more desirable species. Thinning has numerous benefits. It provides space for selected crop trees (the most desirable trees) to grow for future harvest, produces income from harvested trees, and reduces vulnerability to disease and insects. Thinning also allows more vigorous understory growth and provides food and cover for many wildlife species. Thinnings, sometimes called improvement cuts, usually create income for the owner. Removing undesirable trees is called timber stand improvement (TSI). It upgrades the species composition and the quality of the stand and improves the growth of timber crop trees as well as mast trees for wildlife. Unwanted trees may be cut down, treated with herbicide, and / or removed to use as firewood. They also may be deadened and left standing to provide snags for wildlife. In general, the difference between thinnings and TSI is that thinnings produce income, whereas TSI is an expense. One method of forest management is controlled or prescribed burning. It involves burning under carefully controlled conditions. Special attention is paid to factors such as the moisture in leaves and twigs on the ground, the wind speed and direction, and temperature. Controlled burning lowers the risk of wildfire by reducing the buildup of leaves and other fuel for fire and by removing less desirable species that aren’t as fire-tolerant. Controlled burning also creates an open stand and stimulates the growth of many fire-enhanced flowers and legumes. But controlled burning may damage potential timber crop trees and is not a good practice for all forests. Controlled burning is most often used in fire-tolerant pine stands but is increasingly being used in other forest types. Before conducting any burn, consult a forester. When burning, consider both aesthetic and habitat modifications. Leave unburned areas around critical habitat or highly valued areas. Level and reseed plowed fire lines with attractive and wildlife-friendly plant mixtures. Also, try to mimic a natural transition or edge around the burned area by curving fire lines. As a forest reaches biological maturity, it ultimately begins to decline and becomes increasingly susceptible to disease and insects. Eventually, trees die. Deciding how long to maintain your forest depends on factors such as your objectives, market conditions, future land use, insect infestations, storm damage, and appearance. Deciding when to conduct a harvest also has a lot to do with the tree species being grown. Timber is often harvested when all or some of the crop trees reach financial or biological maturity. A stand has reached financial maturity when it has matured sufficiently to produce the desired timber product. Depending on the tree species, this age can range from as early as 30 years for white pine to as old as 90 years or more for some oaks. However, a tree species may not reach biological maturity until after its financial maturity. For many mast-producing hardwoods, optimum mast production does not occur until age 50 and beyond. When you decide to harvest the timber on your land, be sure to plan wisely. This preparation is essential for several reasons. Harvests in mature stands can produce significant income for the owner while also creating diverse wildlife habitat. The steps that you take at this point lay the groundwork for the kind of new forest that you would like to emerge after the harvest. Different types of harvests produce different outcomes. Harvesting lightly and frequently (selection and group selection) regenerates stands containing trees of many ages and sizes. This approach favors tree species that prefer shade. More complete harvests (shelterwood, seed tree, and clearcutting) allow more sunlight to reach the ground, so they favor faster-growing, shade-intolerant species. Complete harvests tend to promote stands of one age or at most two ages. These harvest options are described in more detail below. You can work with your forester to determine the forest harvesting strategy that best fits your needs. Several options are available. Trees can be removed by hand- or machine-felling, and they can be dragged by machine or livestock to a loading area (deck), where logs are loaded and hauled to market. Your forester can make sure your objectives are met and any special concerns are addressed. Timber harvesting, skidding (dragging), and hauling on forest roads and trails may cause erosion, soil degradation, and sedimentation, which is the pollution of a water body with soil. With the assistance of a forester, you can draw up a timber sale and harvest contract that minimizes environmental harm and assures BMPs are used to protect water quality. There are many advantages to partial harvest, such as more frequent income and visual attractiveness. A major disadvantage is that it requires more roads and trails, which greatly increases the potential for erosion and sedimentation. Also, selection partial harvest systems do not work well with valuable shade-intolerant or moderately shade-tolerant species, including many pines and quality hardwoods. Single- or group-tree selection involves harvesting only certain trees in uneven-aged stands that have trees of more than two ages and size classes. Species that thrive in full or partial shade are best suited to these stands. This type of management is complex. It is better suited to larger stands, particularly where the owner wants repeated, frequent timber harvests and income. Considered more pleasing to the eye, selection does require more access roads and trails for timber harvests. Extreme care must be used to avoid damaging trees left after each selective harvest. Seed-tree harvesting is similar to clear-cutting, but 4 to 20 high quality, seed-producing trees are left per acre to naturally reseed the site after harvest. This method produces an even-aged forest. It is crucial to plan the timing of the harvest to assure adequate seedfall. Planning is also required to remove the seed trees after regeneration since loggers are reluctant to return where there are few trees left. Risks include either not having enough seeds or having too many seeds, resulting in an understocked or overstocked stand. More seed trees (21 to 60) are left per acre in a shelterwood harvest. This harvest is a preferred even-aged natural regeneration system for nonprolific, seed-producing species and as a visually appealing system for hardwoods and conifers. It provides an abundance of seed and shelter for seedlings, as well as residual shade that can curb unwanted competition. Since there is a larger number of trees left, loggers are more willing to return and remove the shelter trees after regeneration is established, usually within 3 to 5 years. Clear-cutting removes the entire marketable portion of the stand in one cutting. It is efficient and easy to administer and is appropriate for smaller stands of 5 to 20 acres or where the stand is of poor quality and / or even-aged regeneration is desired. Certain tree species grow best in even-aged stands, where all the trees are approximately the same age. This is particularly true of species that do not grow well in the shade. Normally these stands are harvested by clear-cutting or other techniques that allow enough sunlight to reach the forest floor, such as shelterwood or seed tree harvests. While clear-cutting creates a drastic landscape change that may initially appear unsightly, it can produce many benefits. Clear-cutting provides the early growth conditions that many wildlife species require. It promotes serviceberries, dogwoods, redbuds, and other small flowering trees and a diversity of wildflowers and grasses attractive to butterflies and other wildlife. Clear-cutting also can be more aesthetically pleasing if planned and conducted correctly. Harvesting from small areas scattered over the landscape to provide more edge and landscape diversity. Harvesting irregularly shaped areas to create more edge. Separating harvested areas with uncut timber areas to enhance habitat diversity and to provide corridors for animals to travel. Leaving strips along streams undisturbed to protect water quality and to provide corridors for wildlife to travel. Protecting den and mast trees and snags during harvest. Once a forest opening has been created through harvest or some other disturbance, such as fire, wind, or ice, you may want to retain all or part of the opening. Forests of similar age or species can be made more diverse by creating or managing openings. They can enhance views, improve wildlife habitat, and increase plant diversity. In our region, openings will eventually grow back unless steps are taken to maintain the openings. You can do this through the use of one or more of the following methods: mechanical clearing, periodic mowing, or disking; selective herbicide control; controlled burning; farming; timber harvesting; and controlled grazing. Ask a forester or a resource professional from the agencies listed on below about how to use these methods to create and protect open space. Retaining or planting native trees and shrubs of varied shape, form, flower, or foliage color. Creating irregularly shaped, undulating forest edges to improve visual diversity. Planting or maintaining irregular clumps of trees along the edges to create a natural appearance. Favoring a mixture of hardwoods and conifers for variety along the edge. Minimizing the contrast between the opening and the forest is the primary goal in making the forest edge look attractive. Shoot for a soft transition from the low vegetation of the opening to shrubs, and then to taller trees. Also, selectively remove unproductive trees to promote native soft mast producers, such as black gum, dogwood, wild cherry, sassafras, persimmon, serviceberry, blueberry, greenbrier, and Virginia creeper. Small-diameter trees can be felled with a chainsaw and used for firewood or cut into smaller sections and scattered into the wood’s edge as cover for wildlife. Native wildflowers will often grow in young growth areas. Old fields, low meadows, forest edges, and other open, sunny sites can often be managed for native wildflowers that will attract butterflies, hummingbirds, and songbirds, as well as provide a display of color and interest from summer into fall. If you have such an area, you can begin by allowing the existing vegetation to develop over the course of one growing season without mowing. Once you have a desirable variety of meadow wildflowers, you can maintain them by mowing once every other year in the early fall to remove woody competition and to redistribute seed heads. Mow your wildflower meadow high, leaving at least 8 to 12 inches, so the crowns of the plants are not damaged. Contact your county extension agent or regional stewardship biologist with the N.C. Wildlife Resources Commission for details on establishing a wildflower meadow. Forest roads are important for fire access, harvesting, reforesting, and other management activities. Unfortunately though, they are often neglected and left to erode. In steep mountain areas of North Carolina, forest access roads can lose as much as 200 tons of soil per acre of roadway during the first year following disturbance. For this reason alone, it makes sense to properly stabilize your roads. A well-maintained road can also yield multiple benefits for woodland owners. Roads planted to a wildlife-friendly mix of grasses and legumes can attract deer, turkey, grouse, quail, rabbits, and other animals. You can also use these roads for wildlife observation and recreational hunting. Whether you are rehabilitating an old permanent road or stabilizing skid trails and haul roads after a harvest, you may need to rework the road surface to ensure good drainage. Moderate grading may be a wise investment that can prevent costly major repairs. Before planting, install a series of water diversions at proper intervals so that surface sheet flow is controlled. Contact your local Soil and Water Conservation District office or the county forest ranger for specifications and a list of contractors. In maintaining roads, you can benefit wildlife by removing trees shading the road surface in a process called daylighting. Sunlight on the road surface enhances the growth and spread of grasses and forbs, which provide food for wildlife. Insects attracted to the vegetation are also an important food source for many wildlife species. Restricting vehicle traffic increases wildlife use, particularly during nesting season. Plan ahead to minimize the number and extent of roads. Keep road grades below 10 percent to minimize erosion and maintenance. Place roads and trails on the contour, taking advantage of natural curves within the landscape. Surface heavily used roads with mulch, vegetation, or gravel to reduce erosion. Note: Do not substitute or add tall fescue or Sericea lespedeza to this mix. Although they are widely used for erosion control, neither is very beneficial to wildlife. Other mixtures are available for cut banks; shallow, rocky soils; or dry, south-facing areas. Water resources are valuable assets. If you are fortunate enough to have a stream or pond on your property, you should take special precautions to preserve this important resource. In addition to providing vital habitat for many fish and wildlife species, bodies of water provide a source for recreational activities, such as swimming, boating, fishing, and nature study. Other potential benefits include irrigation, fish farming, increased real estate value, and fire protection. The role of forests in stabilizing soils and protecting watersheds is universally recognized. But when a forest is disturbed, the potential for erosion and water quality harm increases. You can help protect water quality by using best management practices (BMPs) in managing your forest. BMPs can minimize, eliminate, or reverse water quality harm. Before beginning any activities, you need to walk your property and identify such things as the sensitive zone around or along your body of water; soil types; steep slopes; unique natural areas; and wildlife habitats. Ask a water quality forester or other resource professional from the agencies listed below about how to use BMPs in your forestry operations. Access to your property is essential and can provide multiple benefits. Whether temporary or permanent, roads provide access for timber harvesting, management, and recreation and are used by wildlife. Proper location, design, and construction increase the value and enjoyment of your forest. Improper construction and maintenance of roads, trails, and firelines is the major cause of erosion and water pollution by sediment stemming from forestry activities. Planning will identify the specific BMPs that will assure that your road and trail system is water quality friendly. A description of several road BMPs follows in this guide. A well-planned road, trail, and fireline system minimizes the number of stream crossings; fits the topography of the site; avoids critical streamside areas; and includes appropriate drainage and water control structures. Hand-constructed firelines should be used on steep terrain. Remove all temporary stream crossings. Inspect roads, trails, and firelines to be certain that all water control structures are in place and functional. Remove and properly dispose of all waste, tires, oil, and trash. Place mulch on bare areas or plant vegetation there to reduce surface runoff and erosion. Wide enough to capture and filter soil and pollutants. No more than 40 percent of ground is bare, and vegetation is evenly distributed. Bare soil areas are promptly replanted or mulched. Wheeled or tracked-type equipment is excluded, and there are no roads, trails, sawmills, log storage areas, or log decks in the zone. No broadcast pesticide or fertilizer application is allowed. Fertilizer is carefully applied, avoiding even indirect entry into water bodies. Shade is retained to maintain stream shade and temperature. 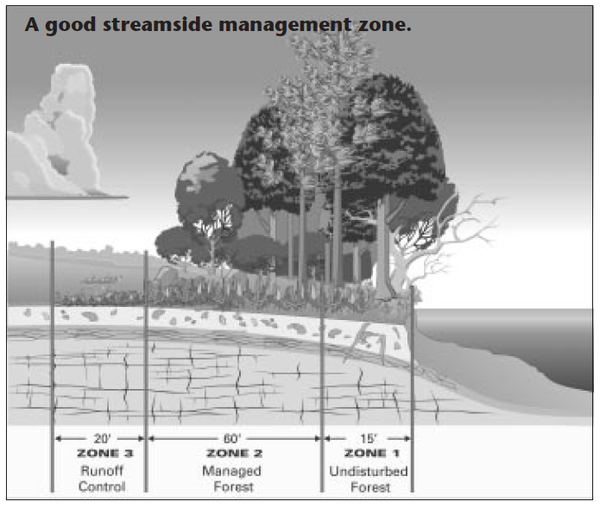 Streamside management zones (SMZ) are critical BMPs. These zones are areas along a perennial stream—or along an intermittent stream that flows more than 30 percent of the year—that require extra precaution during site-disturbing activity. Their purpose is to slow and spread surface water flow and to trap and filter suspended sediments before they reach the stream. SMZs also provide stream shade and function as buffers to filter and capture fertilizer, pesticides, and other potential pollutants. These zones should be from 50 to 200 feet wide, depending on the stream, the soils, and the topography. Heavy equipment use is discouraged in the SMZ. Limited tree harvesting is allowed there if trees can be felled away from the stream and removed with extreme care, leaving the forest floor and ground cover vegetation largely undisturbed. On larger tracts of managed forests, snags and den trees for wildlife should be retained within SMZs. 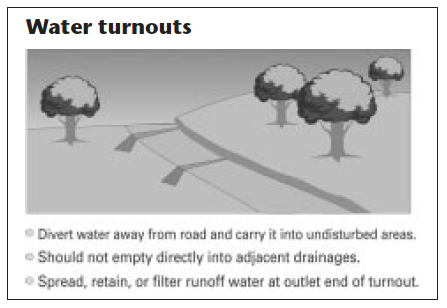 Water turnouts are ditches, trenches, or waterways that divert water away from the road surface. They carry water into an undisturbed area where the flow slows and sediments are filtered and trapped. Cross-road drainage is the transfer of water across or under a road, usually by a round culvert. It is used on any road or trail where storm water runoff, ditch-to-ditch transfer, slope, or overland seepage might cause erosion. Pipe culverts 15 inches or larger are normally installed on permanent roads and trails. 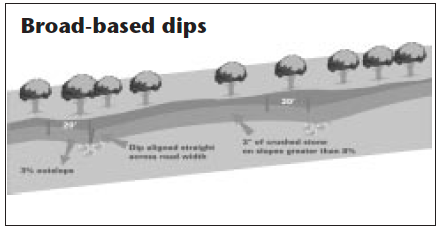 Broad-based dips create a reverse uphill slope in a road surface, slowing and moving water off the road surface into an undisturbed adjacent area. Rolling dips are rounded humps that create a reverse slope and turnout. They are often used in skid trails where logs are dragged to a log loading area (deck). The rolling dip provides cross drainage, slows water flow, and holds up better under heavy traffic. 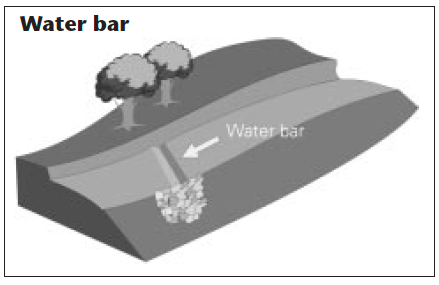 Water bars are a combination mound-trench built into a road or trail and sloped slightly downward to move water off the road surface into an undisturbed, adjacent area. Water bars are usually installed after the road is no longer used. Pipe culverts. Considered expensive, pipe culverts are usually used on permanent roads. However, they can be used on temporary roads and trails and removed carefully afterward to minimize soil disturbance. 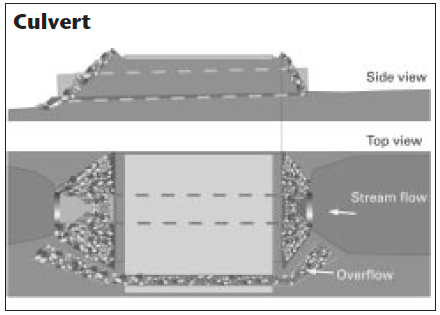 Culverts must be of adequate diameter to handle above-normal water flow, long enough to extend slightly upstream and downstream from the crossing, and be installed with a 2 to 4 percent downstream angle to aid in flushing out debris. A single culvert, sized to handle the water flow, is less likely to clog than several smaller stacked culverts. Backfill material should be free of debris, and the culvert should be covered with fill to a depth of one-half the diameter of the culvert or a minimum of 1 foot. Bridges. Temporary or permanent, bridges can be used to cross streams where culverts won’t handle the stream flow. Bridges should be built to handle heavy loads using the proper type and size of materials. Professionals can help design your bridge. Streams and stream banks should be protected from degradation during construction by using erosion barriers such as silt fencing, hay bales, and temporary seeding. Abutments and headwalls may be needed to handle flood conditions and stabilize the approaches to the stream crossing. Use vegetation or ground cover to stabilize road approaches and road banks. Fords. Fords should be used for temporary or minimum-use crossings only where the stream has an applied or existing firm base. Rock, brush, poles, or other materials stabilize the road or trail approach to a ford and the streambed to protect the stream channel. Stone is usually not removed after road use ceases, but poles, brush, and other materials are. Permanent fords can be installed in the streambed to allow vehicles to cross without causing erosion. Along roads, forest edges, logging decks, and in created openings, ground cover vegetation controls erosion, improves water quality, and can enhance wildlife food and cover. Recommendations vary widely for establishing this ground cover, depending on geographic region, soil type, moisture availability, and fertility. Successful plantings require soil testing, fertilization, adequate seedbed preparation, and planting at the appropriate time. Most ground covers require maintenance by mowing, disking, burning, fertilization, or liming. Consult a natural resources professional from the agencies listed below for specific recommendations for your area. Whether you’re managing for timber, wildlife, aesthetics, or recreation, BMPs are common sense practices that apply to any site-disturbing activity. The key is to plan to protect water quality before the activity begins and to follow through by using appropriate best management practices. Keep in mind that protecting our water resources is everyone’s responsibility. Stream crossing - bridge design. Stream crossings - fording a creek. A forest is more than trees. Forests are fully functioning systems that provide resources, clean air and water, jobs, beauty, and enjoyment for millions of North Carolinians and visitors from around the world. When we maintain the health of our private forests, we are adding to the community’s wealth in real dollars and, more importantly, in benefits to the environment. You’ve taken the first step by working through this guide. Now the acorn is in your hand. Consult the agencies listed below to make that seed grow into the forest of your dreams. Land management in western North Carolina has its own unique challenges. Planning first can help you avoid costly and irreparable mistakes. Whether you are clearing a homesite, building access roads, harvesting a stand of timber, or constructing a pond, you can find information and expertise to assist you. N.C. Cooperative Extension provides educational materials and workshops for landowners. A wide variety of publications is available from the Extension office in your county or at the online publication repository. Extension Forestry provides educational programs as well as print and online publications. North Carolina Forest Service is the state agency that helps private landowners manage forestry on their property. The county forest rangers are supported by foresters who can develop a management plan to address your forestry objectives. The NCFS also administers the Forest Stewardship Program, which provides plans for enhancing your forest’s many benefits. North Carolina Wildlife Resources Commission employs biologists who can give landowners information and technical assistance about wildlife management. Natural Resources Conservation Service is a branch of the U.S. Department of Agriculture. District conservationists are available in most counties to help landowners protect their soil and water resources. They can provide on-site planning advice and assistance. Educational materials are available from local offices or can be found on the web site below. North Carolina Department of Environmental Quality includes the Divisions of Water Resources and Energy, Mineral and Land Resources. Both divisions assist private landowners. North Carolina Board of Registration for Foresters oversees North Carolina’s forester registration law. Contact this board to find out if someone is a registered forester. North Carolina chapter, Association of Consulting Foresters, consists of private foresters who provide planning, advice, and assistance. Planning is not a single event, but a series of continuous steps leading to a desired goal. Forest management plans are, by necessity, long-term. The plan guides activities for decades, providing continuity through successive generations of owners. If possible, all owners and heirs should be included in developing and modifying a long- or short-term plan to ensure continuity of management. The plan can be as detailed or as general as you desire. The first step is to determine your priorities, set goals, and identify how to reach those goals. Plans are not set in stone; you may modify yours at any time. The plan you develop is an operating plan based on current conditions and facts that will help you meet your objectives. Plans are unique to each owner and forest. Plans should be reviewed and updated at least every 5 years or as conditions change or you develop different objectives. A well-written plan should begin with a statement of the landowner’s goals for ownership. Long-term goals (for more than 10 years) are usually general. Short-term objectives are more targeted, with specific practices and timetables outlined. These include timber stand improvement activities, stand thinning schedules, timber harvests, site preparation timetables, and methods and timings for regrowth or replanting. Your plan should have a large enough map and / or aerial photograph to show the location of the property and how the property can be accessed. Boundaries should be clearly marked and described. Marking and maintaining property lines and corners. Road, trail, and access control. Insect and disease inspection, protection, and salvage. Timetable for reviewing and updating the management plan. Each stand should be described and correctly marked on the property map and / or aerial photograph. It is essential to list soil types, the number of acres, tree species, stand age, stocking (trees per acre), range of tree diameters, average tree height, standing timber volume, tree condition and health, and unique water quality or drainage information. Owners with wildlife, recreation, aesthetic, or other objectives should describe the stand’s importance to other plant species and to wildlife. Timber harvests, commercial timber thinning, pre-commercial thinning. Regrowth or replanting practices, such as site preparation, tree planting, natural regeneration recommendations. Weeding and / or timber stand improvement practices. Steps to attract and maintain populations of wildlife. Installing and maintaining water quality protection practices. Enhancing the stand’s aesthetics, recreational use, diversity of plants and wildlife species, and appeal to wildlife. Complying with government regulations, such as the Endangered Species Act, Clean Water Act, and state water quality laws. Once you have drawn up your forest management plan, be sure to follow up on it. Wildfire, insects, diseases, and overgrazing are destructive to your forest. Frequent visits by you and a forester are recommended to check firebreaks, evaluate your forest’s health and vigor, and protect your investment. Fill out this questionnaire with your family and share it with any resource professional you choose to help you develop a plan for your forestland. 2. What are your resource priorities? 3. Which water quality protection would you undertake? 4. What are your recreation and aesthetics goals? 5. Which forest management approaches appeal to you? Initial funding and support were provided by the U.S. Environmental Protection Agency; the USDA Cooperative State Research, Education, and Extension Service; and the N.C. Division of Forest Resources’ Forest Stewardship Program.